Whittling is a long-time hobby for people around the world. It involves carving different woods into little statues, ornaments, and figurines. But in order to get a good result, you will need the best pocket knife for whittling. It should be sharp enough to make the challenge easier but it should also be compact, so you can bring it easily and work on your project anytime. Whittling is a hobby that can be done by anyone. Whittling is one of the cheapest hobbies there is. You only need a whittling knife and a piece of quality wood. The rest is up to your skills and your imagination. When it comes to carving wood, it is important that you have the best tool you possibly can. There are specific types of pocket knives that are specifically made for whittling. These usually have differently-shaped blades that can make it easier to carve various designs on wood. However, some use their own trusty pocket knives that they just bought off a normal shop. Pocket knives have long been used by hobbyists because of its compact size -- you can bring it anywhere and if you see a good wood, you can immediately start whittling. Add to that the inclusion of various blades in one simple tool. 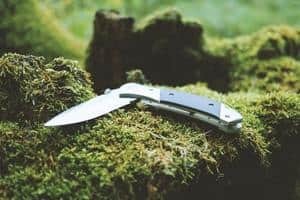 While pocket knives are known as a survival tool for most people, this review is aimed towards whittling enthusiasts and those who are just starting with the hobby. Therefore, the factors and the performance we’re basing is how good it is in carving wood. To find the right choice for a pocket knife for whittling, here are several factors to consider. A great pocket knife for whittling is comfortable to use, even with a variety of grips. When carving wood, you’ll be gripping on your knife hard. A bad whittling knife has a handle that will give you discomfort and even pain. The best choice is to find something that fits your hands well. This is often subjective, as some people handle their knives differently. There’s also the structure of your hand which could fit differently-sized handles better. The important thing is you test it out and see how comfortable it is. You should also opt for more light-weight choices. Heavier blades and pocket knives can be tiring to hold and you should expect a session can last an hour at the very least. Holding something heavy could easily tire your hands and make you lose your grip or your strength. Of course, the sharpness of the blade is an essential factor. Wood is a rather hard object, even if you’re choosing softer types. It should easily cut through it without much problem making your work smoother and avoid any splinters that could harm you. However, the blade should also stay sharp for a longer period of time and avoid corrosions even when being in contact with water or moist wood. These types of blades are often made from stainless steel. The only downside with this is that it dulls in time, making it harder to sharpen when necessary. If you can afford a carbon steel knife, it’ll be easier to sharpen and has the same sharpness. Some pocket knives have 10 or more blades. While this may look like a huge steal, it’s rather inconvenient -- especially when you’re using a blade that isn’t at the center. Imagine the time you have to consume when you need to find the blade you’re using. It’s more convenient when you buy a pocket knife for whittling with a maximum of three blades. A good whittling knife should be sharp to cut through the wood. The blade shape can change the way you carve. For example, a drop-point blade is a type of blade where the point of the knife is located at the center. This is the most common blade shape knives, especially pocket knives, have. While this is a good choice for general cutting purposes, it is tough to create smaller details with this blade shape. For that, it is best to opt for a sheepsfoot blade. This is a type of blade shape where the knife’s tip is close to the knife’s edge. It’s the usual shape of a standard bench knife and a utility knife. If you can find a pocket knife for whittling with these two blade shapes, the better. This is a safety feature that guarantees the blade won’t snap on your fingers when you are using it. This is a good feature for beginners who are still trying to figure out the best way to handle their pocket knives as well as cutting the wood. However, not every pocket knife has this feature and it’s really a matter of personal preference. Some people have started without lock blades. The only important thing is you are mindful of the blade or you can wear gloves for your first project. When choosing a pocket knife for whittling, you’ll likely come across two types - one with a fixed blade and the other with the folding blades. The latter is a common concept for conventional pocket knives while the former is basically for whittling only. Fixed blades are often used by professional artisans. These have blade covers to protect the blade when not in use. However, it can be inconvenient to bring along everywhere you go. For that, folding blades or pocket knives work better. These are very portable plus the choice from two or more blades is also possible. Again, this is a matter of personal preference. The price is obviously what every person should consider anything they buy. For first-timers who don’t have a lot of money to spend, choosing a good but cheaper pocket knife for whittling would be a good idea. Unless you’re able to acquire extra money or you can earn from your carvings, you can begin acquiring special knives for carving that are often more expensive. The Opinel pocket knife is a good choice for a whittling knife. Top Choices for the best whittling knife. 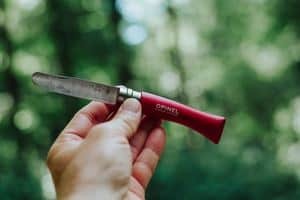 The Opinel stainless steel pocket knife is a staple in the world of knives and pocket knives. Opinel is well known from the 1890s to the present. Their designs remain the same, with the handle created from beech wood to guarantee durability. It has a simple design but colors of the handles could vary. When it comes to sharpness, this stainless steel has a carbon content of 0.40% to provide a sharper edge without the fear or corrosion. It can stay sharp for a long period of time so there’s almost no need for sharpening. However, it is easy to do when needed. These have varying lengths you can choose from. The shortest is a 7 cm blade to 12 cm one with every blade marked with a “Crowned Hand” to represent its origin and quality. It also has a Virobloc safety ring invented by Marcel Opinel which makes sure the blade is locked when not in use and when being used. This Fury pocket knife boasts its Rose Pakka handle that gives it a rather beautiful appearance. Overall, the design is small and is definitely compact -- a good choice when you’re trying to whittle some wood on the go. However, you have to consider the handle’s length and size. If you have bigger hands, this might take some time getting used to. But it can be used by a beginner to advanced professional. The blade is 2-inches and made from stainless steel. This helps avoid corrosion and provides the right sharpness for carving. However, due to its stature, sharpening can be a little challenging. It can keep its sharpness for a long while, though, so before you sharpen it, you might have been used to how small it fits your hands. This pocket knife does not have a safety lock. However, it stays in place when you’re using it. But do take caution when you’re trying to close it as it rather snaps quickly into place. It also looks and feels sturdily built and rather light-weight. This Flexcut JKN88 whittling knife is a good choice for beginners, especially with its two blades that were specifically designed for whittling. When it comes to design, it has a rather small stature which is great when it comes to portability. The handle is a little bigger so it can be comfortable to hold. It also features a walnut inlay handle which has a sturdy look and feel to it. The blades are made from carbon steel blade offering sharp edges that stay sharp for a long period of time. It also makes it easier to sharpen, although a bit tricky at first because the blades are rather short. For optimum sharpness, you can keep sharpening it every now and then, especially after a carving session. When it comes to safety, it doesn’t feature a lock which can be a little troubling if you aren’t mindful of what you’re doing. It’s also possible you’ll get cut the first few times you use, especially when you close it or it suddenly closes when whittling. It’s also a little hard to open the blades due to the nail nicks in it. This Sarge Knives SK-10 N Vision Maker has double blades for carving. It can be a good whittling knife for beginners and even for professionals. The handle has some simple design that can fit any hand sizes and therefore, is very easy and comfortable to hold. The blades, on the other hand, are perfect for making detailed cuts and cutting chunks. Made from high-quality stainless steel, the blades are rather sharp but will require some sharpening first before it can be used for serious whittling. It also takes quite a long while to stay sharp but will need maintenance every now and then to keep sharpness. Because it’s made from stainless steel, it can avoid corrosion that can damage it. It does have a slip joint lock which guarantees it stays locked when being used and when not used. This safety feature is a good choice for beginners. Overall, it has a sturdy look and feel with a good size for portability. 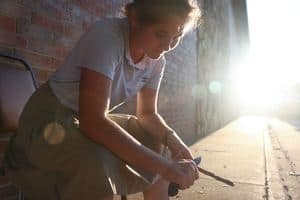 Whittling is a good hobby that you can start at a young age, although parents’ supervision is required. And in order to create a good design and acquire good technique, you’ll need the best pocket knife for whittling.